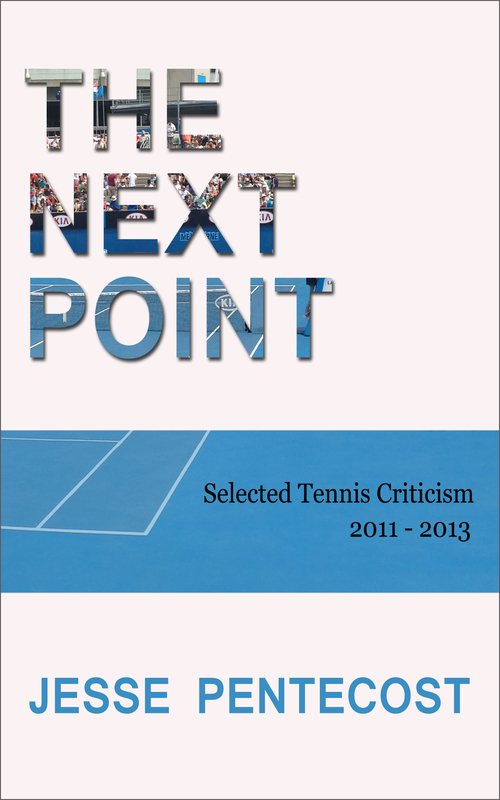 It is with great pleasure and a small measure of trepidation that I announce the release of The Next Point: Selected Tennis Criticism 2011 – 2013. 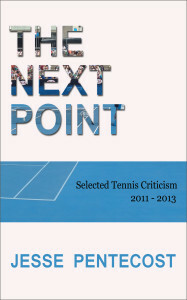 This new volume features what I consider to be the best tennis pieces I have written in the last three seasons. There are about fifty of these. There’s also a fairly long introduction, in which I essay a general explanation for the term ‘tennis criticism’, lash into the unacceptably poor standard of so much current tennis writing, and declare that Mikhail Youzhny will win this year’s US Open. While I have attempted to choose only the best pieces, I have also been guided by a sense of variety. It wouldn’t do if all the selections happened to fall during a particular tournament or all focussed on a single player. Given that I find certain tournaments and players inherently more rewarding to write about, this was a very real concern. Tomas Berdych, for example, features frequently, while Juan Martin del Potro features hardly ever. This doesn’t reflect any personal preference for the Czech over the Argentine. Indeed, I’ve always felt sympathetic towards del Potro, while Berdych was a taste laboriously acquired. I used to have great fun thinking up new ways to suggest he was a robot. Given Berdych’s new-found humanity, I could no doubt mount a persuasive argument that he is a more inherently literary character. But it’s probably just a coincidence. I quite like Andy Murray, a very literary character, but he doesn’t feature much, either. I urge you not to read too much into it. My articles aren’t Michelin stars. My intention is that the pieces in this volume represent the best that I can do, within the broad limits of theme and chronology outlined above. It therefore follows that any pieces that I feel merit improvement should therefore be improved. Admittedly that was also my intention when I wrote them the first time. The difference is that the original pieces were written in a tearing hurry, which is not the ideal way to produce anything. Astute readers will soon discover that many of the pieces in this volume have changed from their original incarnations. The truth is all of them were revised to some extent. In some cases this entailed just a nip or tuck here and there. In other cases the changes were substantial. Some of the pieces were heavily cut, others were lengthened. In a few cases two adjacent articles were combined into one. All up, I’m satisfied there’s more than enough new material to justify the modest asking price ($5.99 US). Long-time readers will perhaps raise an eyebrow at some of the inclusions, and will certainly quibble at some of the omissions. Nadal fans, for example, might wonder why my article on the 2013 Madrid final didn’t make the cut (sorry Miri). I can say that it was in contention, but ultimately couldn’t justify its place next to the Rome final recap from the following week. There were about dozen pieces that nearly made it in, and some were in until late in the editing process. The Luck of the Draw from last year’s Australian Open was cut only a few days ago. Ultimately I couldn’t ask a satisfying first half to compensate for a flat ending. Barnes & Noble Nook Store (.epub). I also intend to do a small print run, though how small will depend on the level of interest. Plenty of people who knew of this project as it progressed have expressed a desire to own a physical copy. If you’d like one, too, please let me know. Bear in mind that it will cost significantly more than ebook versions, to cover printing costs and shipping. I’d like to thank all those who contributed their time, energy and expertise in preparing this volume, especially Alexandra. And as always my everlasting love and gratitude go to Kate, Sabine and Elias, who believes with all his heart that he and Novak Djokovic will one day be best friends. Ah, so this is the mysterious project you’ve hinted at in the comments! And what a wonderful idea it is! I hope this print run you speak of comes true, as I’d be very interested in purchasing two physical copies. A good friend of mine is an avid tennis fan, but she’s also an extremely busy person and it’s always been a challenge for me to get her to read your blog. What better way to introduce her to your superb writing? Congratulations on having it finished! Physical copy or no, I’ll be sure to read it. It’ll be good to give something back after all these years you’ve given us. Ah yes, this is indeed the mysterious project. I think I promised it would be rather better than just another Annual. Hopefully that’s true. Two copies you say? I’ll add you to the list! Ah… this is why we didn’t get any single line to enhance the many tennis highlights of the past week – Federer-Djokovic semi-final in Dubai, Grigor Dimitrov’s heroics to win Acapulco, the unexpected and heart-warming finalists in Sao Paulo… Well, I guess, it is as good an excuse as any. So, heartfelt congratulations… This is great news!!! A real book! And hopefully, it will get truly real to me with a printed version. I just can’t read a book online… An article is my limit… and nothing replaces the feeling of a book in one’s hands. I’d like to buy four copies. Two perfect presents for two of my friends… I’m not quite sure yet what will be the destination of the 4th copy but four feels a right number. My mother may be the beneficiary since she’ll wish to borrow my copy and I won’t suffer it to leave my care. I realize the shipping costs to Belgium will be huge and I’m fine with it. I also hope you won’t price the book too modestly – it is about time you get some financial rewards for your writing at The Next Point! Also if you’d like to be paid in advance, I’d be happy to do so – Paypal or credit card being the easiest way for money to cross the oceans. So we will learn all about Mikhail Youzhny winning this year’s US Open…. I wouldn’t mind! I’m just a bit surprised you have given up on Philipp Kohlschreiber… or do you pencil him for next year? Really really happy about your book and feeling a tiny measure of your own trepidation…. To a joyful celebration and great success! Yes, I watched both Dubai and Acapulco and intended to write about them, but alas, time got away from me. That Djokovic – Federer match was pretty good, certainly better than the scrappy final. And who’d have thought Dimitrov of all people would develop such mental fortitude. I admit I’m one to make fun of Rasheed’s simplistic and borderline kitsch worldview, but it seems to have been just what Dimitrov needed. The simple message cuts through, and to be simple enough it must be shorn of nuance. Four copies to Belgium? No worries at all. No need for advance payment. I still have to work all the details out, but have plenty of reasons not to dally. Jesse, looking forward to getting a print version of you book. Kindle does not work for me here in Canada because it can’t be used with our library system. So it looks like a print copy is the best bet. No worries. I’ll add you to the list. Just so you know, the epub format is also readable on a PC (not that anyone really likes reading books on a PC). Jesse, hi! So good to know about the book. For myself, as I am a lot of time at the computer, I struggle a bit reading e-books. But you can count me in for a paper edition. Tell me if we can make a sort of subscription… Cheers. I’ve got you down for a paper copy. I hope you enjoy it. Not sure what you mean about a subscription? Jesse, congrats on the hard work! I will certainly buy the eBook version very soon – once I get my own writing done to some extent. Needless to say….but it’ll certainly be a joyous experience just revisiting matches I’ve seen or imagining those I haven’t through your writing. Thanks, really hope you enjoy it. It should be fun if nothing else. I enjoy your writing; being from the old school; give me paper please. Look forward to the paper edition at some point in the future. Thanks. I’ll put you down for a paper copy, and contact you when they’re ready for your details. How great. Can’t wait to read it. Paper copy please, when available (shipping to the US). Well done you! Absolutely, Jelena. Consider it done. And thanks! Congratulations!! I enjoy you’re writing immensely, so I’ll get the ebook version tomorrow, sending you good wishes from Mexico. Jesse, it looks like you have fans all over the world! Really hope you enjoy it, Jesna. I’d love to know which are / were your favourites. Got your message about LinkdIn. I’d be happy to connect there but don’t think it’s really necessary as I rarely use it. Just signed up to do some research and never really followed through. I think I’ll follow you through Twitter, I see you there and I’m there a lot. Mostly about tennis, but some entertainment, news, and politics too. I see you have a new book out, congrats. Cheers. I admit I’m not really one for LinkedIn, so no worries. Bought your book from Amazon on my Kindle and finished it pretty much in one go. One of the best sports writings, indeed any writings, that I have ever read. Enjoyed thoroughly. Thanks so much. That’s a lovely thing to hear, and I’m really glad you enjoyed it.